Town & Country and Grand Caravan are mechanical siblings. The former has more upscale styling cues and features and thus costs more than the latter. Model-year 2014 marks the Caravan’s 30th anniversary, and Fiat-owned Chrysler is celebrating by offering both vehicles with a commemorative option package that includes unique interior trim and exterior badging (this despite the fact that the Town & Country debuted six years after the Caravan). 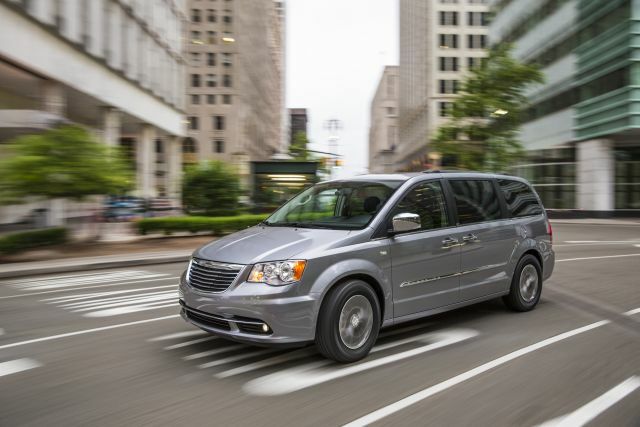 All Town & Country and Grand Caravan models have a standard 283-horsepower 3.6-liter V-6 engine paired with a six-speed automatic transmission. The available Stow ‘n Go seats remain a unique feature in the segment. They allow both the second- and third-rows to fold into wells in the cargo floor, creating a completely flat loading deck without the hassle of needing to remove the seats entirely. With an eye toward luxury, Town & Country comes standard with leather upholstery and rear DVD entertainment. Despite being an entry-level model, the Dodge Grand Caravan American Value Package includes power windows/locks/mirrors, dual-zone climate control, and remote keyless entry. The top-line Grand Caravan R/T includes a performance suspension and sport-themed interior and exterior trim. Both vans drive well, and a wide variety of packaged and standalone options means you can tailor one to your exact specifications. On the downside, there’s a bit more engine and road noise than we would like. Fuel economy ratings are on the low end of the scale for minivans, but are still acceptable given these vehicles’ exceptional versatility. Note that 2014 could very well be the Grand Caravan’s final year, as Dodge will likely replace it with a seven-passenger crossover SUV. Town & Country should stick around and receive a redesign for 2015.